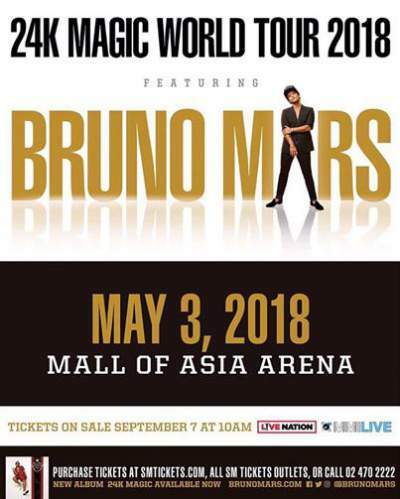 Bruno Mars is coming back to Manila for 24K Magic World Tour - Balita Boss! 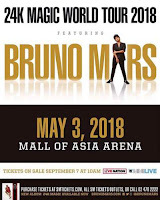 Bruno Mars is set to bring his "24k Magic" world tour to Manila on May 3, 2018, at the Mall of Asia (MOA) Arena, MMI Live confirmed on Thursday, July 27. Tickets will go on sale starting September 7 via SM Tickets yet prices have not yet been announced. The tour, is in support of his latest album, with three hit singles "Versace on the Floor," "That’s What I Like," and the title track "24k Magic". Bruno Mars first performed in Manila during his “The Moonshine Jungle” world tour on March 2014.